Sweden has become the first country to achieve the UNAIDS/World Health Organization (WHO) 90-90-90 target, research published in HIV Medicine shows. At the end of 2015, 90% of HIV cases in Sweden were diagnosed, 99.8% of people were linked to care and 95% of people taking antiretrovirals for at least six months had a viral load below 50 copies/ml. 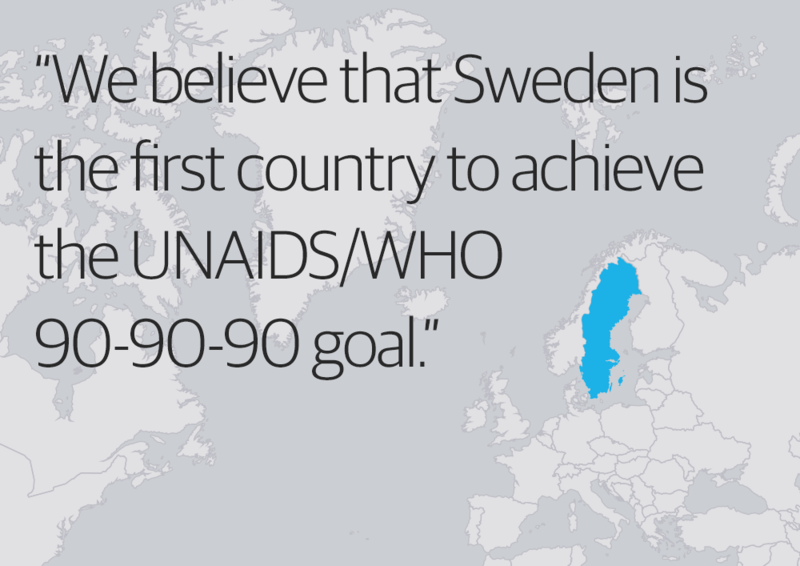 “We believe that Sweden is the first country to achieve the UNAIDS/WHO 90-90-90 goal,” comment the investigators. Antiretroviral therapy (ART) has dramatically reduced rates of HIV-related illness and death and the infectiousness of people taking treatment. For people to benefit fully from treatment they must engage with a multi-step care cascade: diagnosis, linkage to care, engagement with care, initiation of ART and viral suppression. However, in many settings, even in richer countries, sup-optimal levels of engagement with HIV care mean that many people are not benefitting from ART, meaning there are avoidable HIV-related deaths and there continues to be high rates of new infections. In October 2014, the 90-90-90 treatment goals were launched. These proposed that by 2020, 90% of people with HIV will be diagnosed, 90% of diagnosed people will be in care; 90% of people receiving care will have durable HIV suppression. Achievement of the 90-90-90 targets will mean that at least 73% of all people with HIV have viral suppression, a large enough proportion to have a major impact on rates of HIV-related mortality and new infections. Investigators from Sweden used nationally collected data to determine the country’s progress to achievement of the 90-90-90 target. Information on people in care was obtained from the Swedish InfCare HIV Cohort Study. By the end of 2015, data on 6946 diagnosed individuals were included in the study’s database. Surveillance data from the Public Health Agency of Sweden indicated that 90% of people with HIV living in Sweden have been diagnosed. All new HIV diagnoses are reported to the Public Health Agency by both the testing laboratory and the treating physician. To estimate linkage to care, the investigators reviewed all new HIV diagnoses reported in 2014. Out of 471 cases, 469 were linked to care, meaning that 99.8% of people newly diagnosed with HIV in 2014 were linked to HIV care. To estimate retention in care, the investigators reviewed 661 people who entered into care in 2013 and 2014. At the end of 2015, 612 of these individuals were still receiving care. Analysis of the people who had apparently dropped out of care indicated that 29 individuals had moved abroad and eleven had died. Nine individuals had no laboratory follow-up in the previous nine months and were therefore considered lost to follow-up. Therefore, 603 of 621 people (97%) were linked and retained in care. At the end of 2015, 6605 of the 6946 people (95%) in the InfCare data were on ART. A total of 6395 people had been taking ART for at least six months and 95% of these individuals had a viral load below 50 copies/ml. The proportion increased to 98% when 200 copies/ml was used as the cut-off for viral suppression. “In summary, the UNAIDS/WHO 90-90-90 coverage target of 73% of HIV-infected individuals with undetectable HIV RNA has been achieved, with 90% of all those infected diagnosed, 83% of those infected on ART, and 78% of those infected with a suppressed viral load (< 50 copies/ml),” comment the authors. Linkage of patients to specialist treatment centres with multi-disciplinary teams. “We should not be content with these good results, but should continue to improve prevention strategies and increase our efforts to diagnose those still unaware of their infection,” conclude the authors. Gisslén M et al. Sweden, the first country to achieve the Joint United Nations Programme on HIV/AIDS (UNAIDS)/World Health Organization (WHO) 90-90-90 continuum of HIV care targets. HIV Medicine, online edition. DOI: 10.1111/hiv.12431 (2016).